Martin Hauer-Jensen, M.D., Ph.D., is presented with a chair as part of the investiture ceremony, while College of Pharmacy Dean Keith M. Olsen, Pharm.D., and Chancellor Dan Rahn, M.D., look on. Sept. 1, 2016 | Sept. 1, 2016 | The family of the late William E. “Bill” Clark has given $300,000 to establish a distinguished endowed chair in honor of J. Thomas May in which world-renowned radiation effects expert Martin Hauer-Jensen, M.D., Ph.D., was invested Aug. 29 at the University of Arkansas for Medical Sciences (UAMS). Hauer-Jensen, a professor of pharmaceutical sciences, surgery and pathology, is director of the Division of Radiation Health in the UAMS College of Pharmacy. 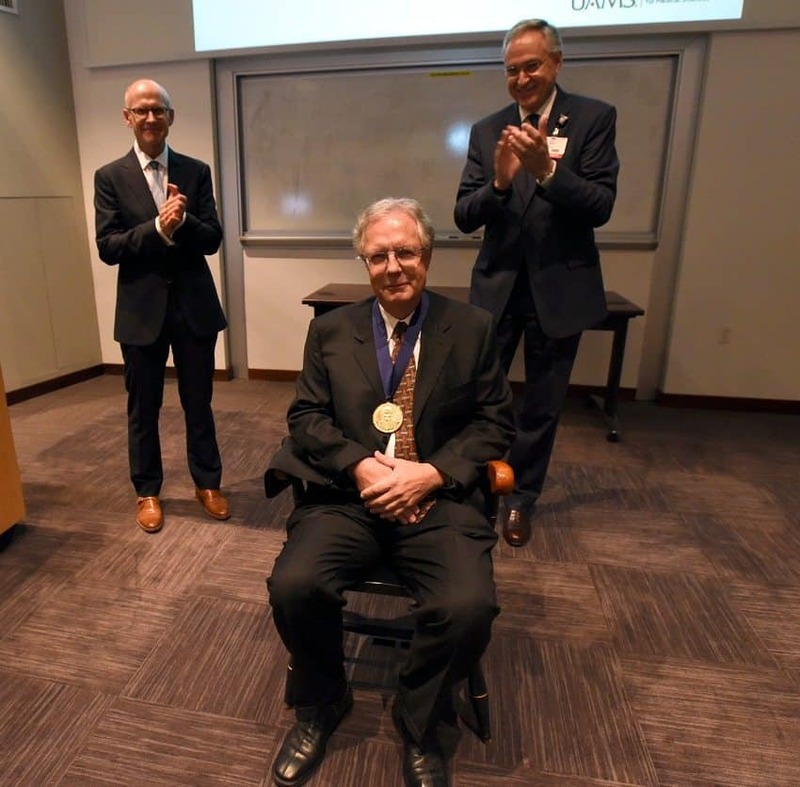 A distinguished endowed chair is the highest academic honor a university can bestow on its faculty and is established with gifts of $1.5 million or more to support the educational, research and clinical activities of the chairholder. Those named to a chair are among the most highly regarded scientists, physicians and professors in their fields of expertise. Margaret Clark (center) and William E. Clark II (right), the family of the late William E. “Bill” Clark, established the distinguished endowed chair to honor their friend, J. Thomas May (left). The J. Thomas May Distinguished Endowed Chair in Oncology was funded by the family of Clark, who was chairman and CEO of CDI Contractors in Little Rock, to honor his friend May, former CEO of Simmons First National Corp.
An endowed chair was established in 2006 with $1 million from Bill and Margaret Clark. Bill Clark died of cancer one year later. The initial investment grew by $200,000 over the last decade. 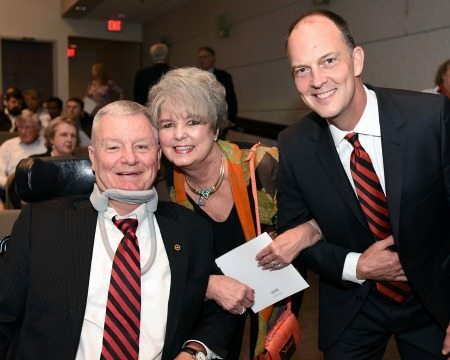 In June, Margaret Clark, and her son, William E. Clark II, chairman of the UAMS Foundation Fund Board, gave another $300,000 to elevate the chair to a distinguished endowed chair. It is the first distinguished endowed chair for a faculty member of the UAMS College of Pharmacy. “We thank the Clark family from the bottom of our hearts for this additional gift. This will benefit our oncology program from now on into the future,” said Peter Emanuel, M.D., executive director of the UAMS Winthrop P. Rockefeller Cancer Institute. Bill Clark, a former member of the UAMS Foundation Fund Board, became friends with May when the two served together for nine years on the University of Arkansas Board of Trustees. “It was a friendship like I’d never seen before,” Margaret Clark has said. A resident of Pine Bluff, May has an extensive background in civic and community service, for which he has received numerous awards, and served on the UAMS Department of Psychiatry capital campaign steering committee. He holds an honorary doctorate of law from the University of Arkansas at Pine Bluff. In addition to Rahn, Emanuel and William E. Clark II, speakers at the ceremony included Stephanie Gardner, Pharm.D., Ed.D., UAMS provost and chief academic officer; Keith M. Olsen, Pharm.D., dean of the College of Pharmacy; and James W. Hardin, Ph.D., chief scientific and administrative officer for SunEcoEnergy Inc., who formerly worked with Hauer-Jensen at the UAMS Cancer Institute. University of Arkansas System President Donald Bobbitt, Ph.D., was also in attendance. “None of this would be possible without my family,” Hauer-Jensen said. 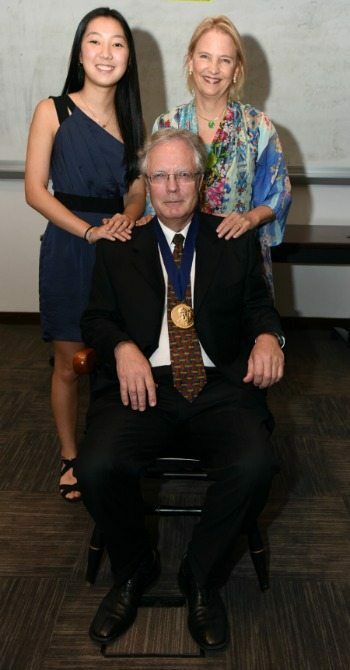 Here he poses with his daughter, Miriam, and wife, Cynthia Ross. Hauer-Jensen was presented with a commemorative medallion by Rahn and Olsen. “I thank the Clark family and Tommy May for making this distinguished endowed chair possible, and Peter Emanuel for organizing it. I am looking forward to working with Dean Olsen to enhance the competitiveness of the Division of Radiation Health,” Hauer-Jensen said. Hauer-Jensen is an internationally recognized authority on normal tissue radiation responses. His research focuses on determining mechanisms of injury and developing strategies to prevent adverse effects after radiation therapy in cancer patients, to make radiation therapy for cancer safer and more effective. He joined the UAMS faculty in 1990 to launch a career in academic surgery. In 2008, Hauer-Jensen moved from the College of Medicine to the College of Pharmacy and was appointed associate dean for research and director of the newly formed Division of Radiation Health in the Department of Pharmaceutical Sciences. Hauer-Jensen is president of the Radiation Research Society and serves on numerous national and international advisory boards, review panels and editorial boards. At UAMS, he co-leads the Host Response and Radiation Sciences program at the Winthrop P. Rockefeller Cancer Institute. He has been chair of the Radiation Study Section of the National Institutes of Health, a consultant on radiological emergencies to the World Health Organization, and a member of the National Council on Radiation Protection and Measurements. He has published more than 250 scientific papers and has received peer reviewed research funding for more than 20 years. He is the recipient of the coveted MERIT Award from the National Cancer Institute.